Even the entry-level electric toothbrush like Oral B Pro 1000 offers an easier way of daily complete mouth cleaning. Compared to using a manual brush, electric toothbrushes can get through most of your plaques, even those in the hard to reach places. As a result, you can expect to have a cleaner and healthier teeth and gums. This may be the very reason why more and more people shift from using a manual brush to an electric toothbrush. 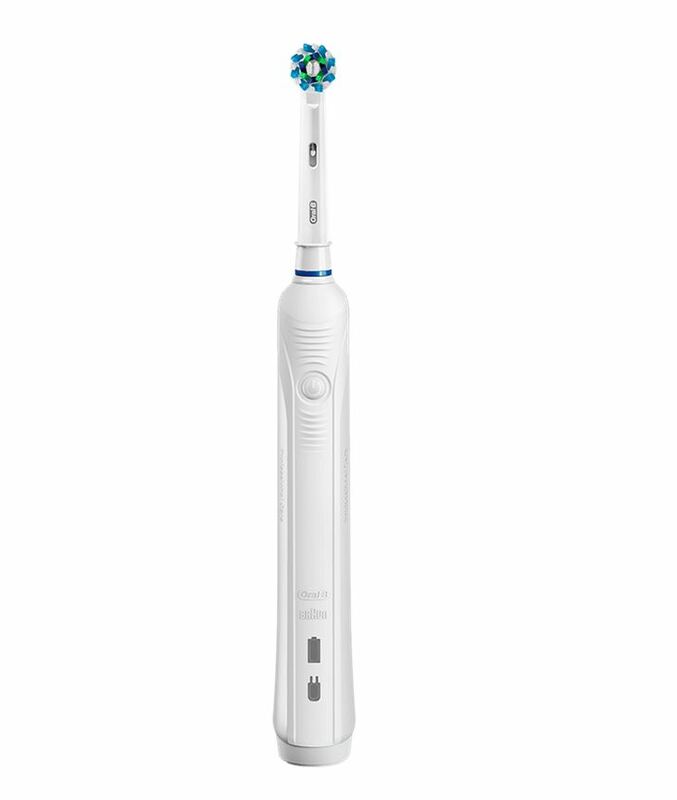 OralB 1000 is one economical choice for a power tooth brush. It has all the basic features that one would need an electric toothbrush, and comes cheaper compared to other brands of its kind. With its advanced cleaning technology, Oral B Professional Care 1000 has been proven to remove up to 97% of plaque, including those in between your teeth. With this, your mouth can enjoy an overall improved condition. 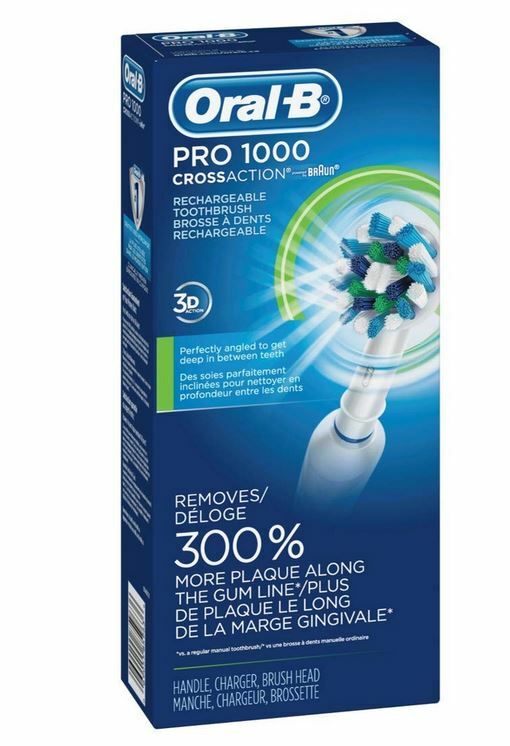 The Oral-B Pro 1000 uses Floss Action Technology to get rid two times the plaques compared to using a manual toothbrush. This advanced cleaning technology goes through every part of your mouth, getting rid of plaque where normal brush misses. Technically, this technology provides an ultimate complete dental cleaning, removing plaques between your teeth and gum line. It leaves you with healthier gums and teeth and makes you feel like you just have gone to a dentist visit. With consistent use, the this Oral B brush promises to improve the general health of your oral cavity. This sits very well, especially for people who have oral health problems. Just like all Oral-B Pro electric toothbrushes, the Pro 1000 comes with a Professional Timer. Though, high-end models usually come with more than one timer option, having just one is proven to be enough for an average user. The Professional Timer sends a short stuttering sound every thirty seconds for you to equally brush your mouth’s four quadrants. A long stuttering sound is sent out after the two-minute recommended brushing time has elapsed. Oral-B Pro 1000 comes with one cleaning mode. The Daily Clean Mode is recommended for everyday use. It provides complete and thorough cleaning action to ensure that your pearly whites are freed of any plaque. If you are looking for a toothbrush with more brushing modes, you should check out OralB 3000 or 5000 models. OralB Pro 1000 also comes with a charger unit that you can use for recharging the toothbrush. It takes about 17 hours to fully charge the toothbrush, and that typically lasts up to two weeks, if used twice daily for two minutes. The red low charge indicator lights up to signal you that the battery is low. And a green indicator light flashes up telling you that the toothbrush is being charged. To keep the maximum capacity of the toothbrush’s rechargeable battery, it is advisable to unplug the charging unit and fully discharge your handle every after 6 months of regular use. The Oral-B Pro 1000 electric toothbrush comes equipped with a pressure sensor. 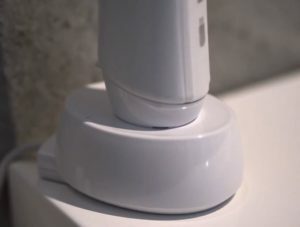 This feature monitors the pressure that you put on your teeth and gums when brushing. If it senses that you are applying to much pressure, it will automatically stop the toothbrush’s rotation. This helps to prevent inflammation of oral mucosa. This advanced technology from OralB is designed to remind you that your brush heads need replacement every three months through the halfway faded bristles. The whole package size is 2.2 x 4.4 x 10 inches and weighs 12.5 ounces. With this toothbrush, you can replace the existing brush head with a different type, if you think it will suit you more. The following are the different types of brushes you can choose from and are sold separately. The toothbrush handle has a simple design, coming in a combination of blue and white colors. The front (where the button is placed and where you can see battery light indicators) is dominantly blue, and then the rest of the handle is clothed in white. The handle seems to be pretty easy and comfortable to use. It seems to be rigid when handled, even when wet with water. The brush head also seems to be very easy to attach and detached from the handle, for the user’s convenience. This toothbrush is getting great reviews, especially since it mostly offers basic features. This speaks greatly about the quality of the toothbrush. One positive feedback that it got from the user reviews says that its design is very well thought and impeccably made. The brush heads may be small but are very effective since it tightly hugs your teeth and gums, resulting in more thorough clean. However, some people noticed that it is a bit noisier than other brushes. Though it does not really give out annoying sound, it something you might want to consider if you think having a little sound can distract you. So why would you want to buy the OralB 1000 rechargeable toothbrush? Aside from its mouth cleaning capabilities, it is undoubtedly very inexpensive for an electric toothbrush. Its price tag is not as high, but you can still get and enjoy the same cleaning abilities and qualities. It can hold up to two weeks of charge and is very compact in size, making very easy to bring around just about everywhere. The available brushing modes may be basic, but it is more than enough to cater to different dental needs. For a basic electric toothbrush and practical price, the Oral B Pro 1000 seems to be a very wise choice. There really is no solid issue on why you would have to think twice in buying this toothbrush. Though, as said, it may give a little sound but if you can deal with a little but not annoying sound, then this is definitely not enough to break the deal. There are several alternative models you can get for roughly the same price. To make your life easier we have already compared this toothbrush with OralB 3000 and with Philips Sonicare Essence 5300. Is it the best electric toothbrush in the budget price range? Yes, I believe it is!